A baurel is a hollae cylindrical conteener, tradeetionally made o widden staves boond bi widden or metal huips. Tradeetionally, the barrel wis a staundart size o meisur referrin tae a set capacity or wecht o a gien commodity. 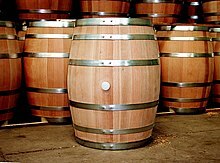 For example, in the UK a barrel o beer refers tae a quantity o 36 imperial gallons (160 L; 43 US gal). Wine wis shipped in baurels o 119 litres (31 US gal; 26 imp gal). This page wis last eeditit on 27 Julie 2017, at 02:38.